You are invited to attend the Second Annual Bird Festival in Chiriqui, Panama on Saturday, May 19th. Enjoy a day of bird watching, educational talks, contests, workshops, and music at Parque Miguel de Cervantes Saavedra. This is a free event to the public. We are excited to announce the 2018 Mini-Grant winners! Thank you to all the organizations that applied. It is wonderful to see the creativity of so many diverse organizations working within their communities in appreciation of their environment, culture, the arts, and conservation! Photo courtesy of Green Jay Mayan Birding, past winners of a mini-grant. 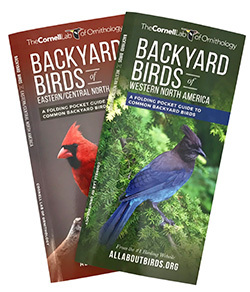 The Cornell Lab of Ornithology launched its All About Birds Pocket Guide Series, 15 new birding titles published in collaboration with Waterford Press. All 15 guides are available now for $9.95 directly through CornellLabPG.com, or at bookstores and other retailers. Watching birds is one of the fastest growing hobbies in North America. The pocket guide series helps people enhance their enjoyment of birds by learning more about them. Complete with detailed species information, photos, illustrations, and maps, these titles cover a wide range of topics for everyone who is curious about birds—from Birding 101 to Nests & Eggs of North American Backyard Birds. “Birds are so beautiful and ubiquitous that millions of people are hooked on watching birds and asking all kinds of questions about what they’re seeing,” said Miyoko Chu, senior director of Communications at the Cornell Lab of Ornithology. There are regional guides for bird identification and guides that explain how to choose a bird feeder or birdhouse and plant a garden for birds. All the guides are laminated for durability. Proceeds help support the Cornell Lab’s nonprofit mission to improve the understanding and protection of birds.